RTS maintains highly stable, mission critical telephone systems and voice mail for DPS. Our staff provides essential technical services for maintaining a statewide system of two-way radios. RTS manages and maintains the Vermont Microwave Network to provide broadband connectivity to public safety. RTS is responsible for the telecommunication systems and equipment used by DPS. Learn more about what we do. 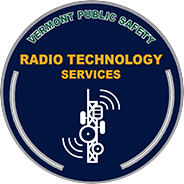 Radio Technology Services (RTS) is an operational unit of the Vermont Department of Public Safety and provides voice and data communication services to governmental entities in the State of Vermont. Those services include: radio frequency engineering, system engineering, communication site management, Public Safety Answering Point design, regulatory compliance, operational and technical support, as well as, related hardware and software maintenance services. The customer list for RTS includes: the Department of Public Safety and the principle divisions within DPS--Vermont State Police, Emergency Management, Forensic Lab, Fire Safety, and Criminal Justice Services; the Vermont Agency of Transportation; the Vermont Fish & Wildlife Department; and municipal police, fire and emergency medical services. In many cases, the systems maintained by RTS are the only means of communication for these users. Maintenance work is an important function of the RTS technician team. The team takes advantage of clear summer weather to make important repairs to critical communication site infrastructure.